Harmony with nature is a fundamental principle in the lifestyles of the Himalayan region. 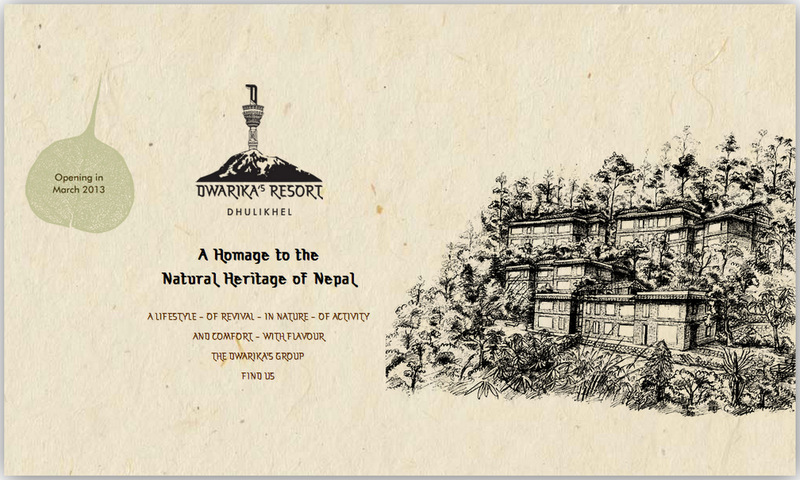 The Dwarika’s Resort Dhulikhel pays homage to the natural heritage of Nepal, and aims to become a completely environmentally sustainable, chemical-free and zero-waste property. The Dwarika’s Resort Dhulikhel will be an ecologically conscious spa and nature sanctuary set in the Himalayan foothills of Nepal. Located in Dhulikhel, the retreat is approximately 45 minutes from Kathmandu, and 35 minutes from the international airport. 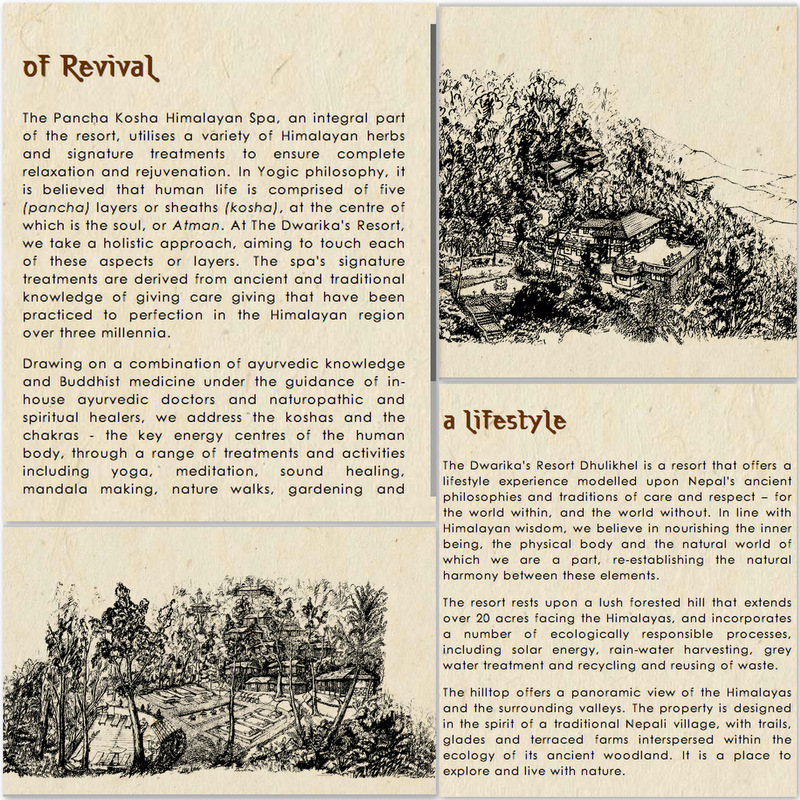 Centred around The Dwarika’s Pancha Kosha Himalayan Spa, the retreat will focus on a holistic and harmonious lifestyle that addresses and regenerates all five layers of being. 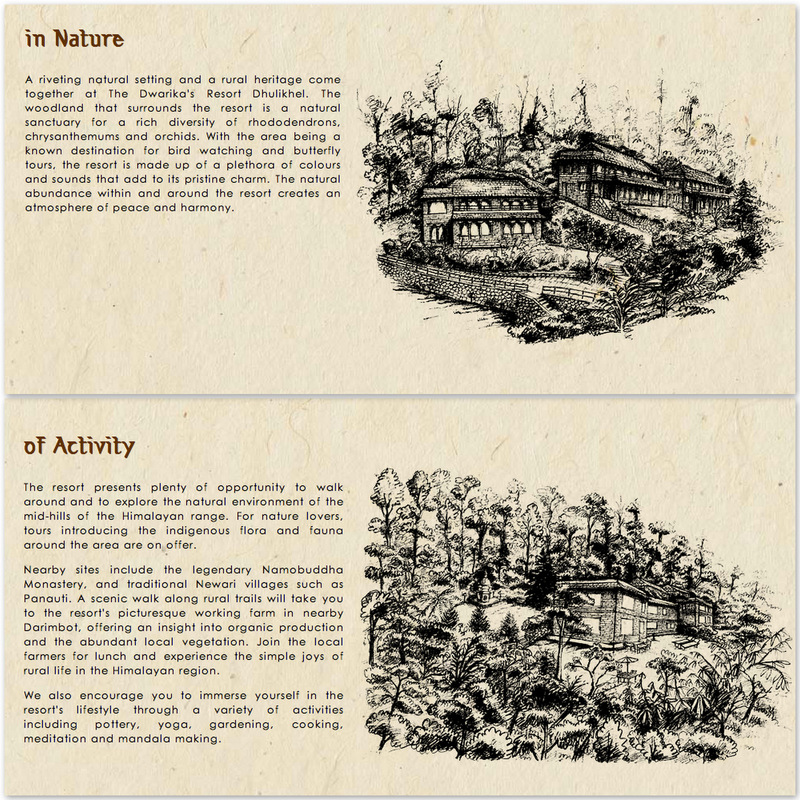 As a Himalayan nature and spa retreat, the resort will focus on knowledge and practices from the Himalayan region for giving care and rejuvenating the mental and physical aspects of the human body – including Buddhist medicine, ayurveda and ethnic and folkloric knowledge and treatments. Guests will have the opportunity to enjoy unique Himalayan spa treatments, gentle hiking and a host of other activities, all with a magnificent view of the Himalayan range ahead. The resort will be launched in March 2013. The resort will contain 39 suites, three restaurants, bar, library, two seminar facilities, separate activity areas and rooms for pottery, mandala making, painting, meditation, yoga, local folkloric dance courses, cookery and lifestyle courses, an infinity pool and a unique spa village with nine individual spa treatment suites, fitness room, yoga room, salt therapy room, eight individual Chakra sound therapy chambers and more. Suite sizes will range from approximately 150m² to 300m², comprising expansive indoor and outdoor living areas in the form of a private garden or roof terrace. The bungalows of the spa suites are built with Bazra mortar and Bazra mud and plaster (primarily lime and brick dust with other ingredients) – an ancient natural building technique which has become almost forgotten. At present there are at most five master masons still available in Nepal who have this expertise, of whom only three are still able to work due to old age. New masons are being trained by the Bazra master masons to revive this knowledge and workmanship. This work is being documented on video for future training, reference and promotion. Being a fast growing and environmentally sustainable material, bamboo is being utilised for some external design, in particular roofing, and bamboo furniture will be used internally where possible. Local natural fabrics and fibres such as cotton, allo, nettle, hemp and jute will be used extensively to promote and encourage natural, organic and domestic products. 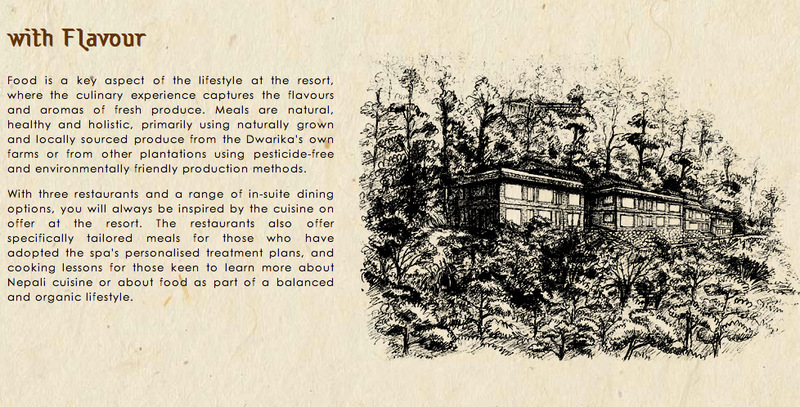 From the beginning of 2013, almost all vegetables and grains served at the resort will be produced through organic agricultural practices, sourced primarily from The Dwarika’s Group’s own farms. Those products that we are not able to produce will be sourced from other farmers and cooperatives that use organic techniques. We will also be sourcing products from regions of the country that have special resources such as unique topography, which gives distinct qualities to the product. Herbs for the kitchen and for the spa will be produced naturally on the resort premises, and sourced from different regions of Nepal. Over time the resort will be developed as a sanctuary for indigenous Nepali plants and flowers. One of the Dwarika’s Eco-Organic Farms is situated five kilometres from the resort, and will be an integral part of the property. In line with our mission to protect and promote Nepal’s cultural heritage, in the future, each suite at the resort will be dedicated to one of Nepal’s endangered ethnic groups – helping to gather and document information and artefacts, and to raise awareness, so that the unique cultures of these groups will be preserved for future generations of Nepalis. For example, it is estimated that the Kusand ethnic group has only 164 surviving members; without effort to collect information and to promote awareness regarding this group, their identity, knowledge and customs may be lost forever. In some ways similar to our mission at The Dwarika’s Hotel Kathmandu to create a living museum for the culture of the Kathmandu Valley, at Dhulikhel we will be gathering information and paying respect to selected endangered ethnic groups; in this way, Nepali and foreign visitors will come to learn about the customs, lifestyles and other characteristics of these groups. Further, in order to support their livelihood, we aim to highlight their handicraft materials by using them in the respective rooms, thus showcasing the skills and crafts of the different groups. These materials and more will be available for sale at our in-house souvenir shop, from which the proceeds will go directly to the producers. The aim of this future endeavour is three-fold: 1) to foster a sense of pride and dignity within these groups in their own cultures and norms; 2) to encourage the collection and documentation of information on these groups; 3) to revive and sustain the handwork skills of each group in an economically viable way. The entire architecture of the Spa Village is based on rural village architecture, using simple building materials that are available locally. Each Spa suite building is made of stone, mud and natural logs. The interior walls are plastered in natural mud, a traditional Nepali method combined with a new technology which reduces the need for maintenance. All external and internal construction work is done by Nepali experts and workers. In the longer term, we hope to initiate a project to encourage income generation for rural communities through tourism and hospitality, drawing on the experience and networks already established by The Dwarika’s Group. We would look to train selected individuals from particular communities on the provision of accommodation that is environmentally friendly, benefits the community, and in various ways integrates aspects of the local way of life. Global tourism trends indicate that there is increasing demand among travellers for experiences that are authentic and environmentally conscious. We feel that accommodation such as those that we envision provide a way to support the local communities and ecologies within which they are situated, while at the same time providing an experience of a lifetime for guests, and thereby supporting sustainable income generation and environmental protection for these areas. The Dwarika’s Group is keen to conduct a pilot project that could become a model for sustainable income generation in fairly remote areas of Nepal. To begin, The Dwarika’s Group would look to guide the communities from behind the scenes, and to market the guest houses to its network, while empowering community members themselves to undertake the ownership and management of the properties. The Dwarika’s Group is Nepal’s premier hospitality group, dedicated to preserving and sharing Nepal’s rich and diverse heritage. At each of our companies and in each of our ventures, our ethos is about giving back; both to our guests, and to Nepal – a philosophy that informs all that we do. We hold at our core a deep respect for the cultural, natural and spiritual heritage of Nepal. In line with these central principles, we constantly endeavour to nurture both people and planet, and to maximise the positive impact that we have on our surroundings. As such, The Dwarika’s Group is moving firmly towards an organic lifestyle that is zero-waste. Further, by using design, artefacts and skills that are inherently Nepali, we seek to revive crafts and cultural knowledge that is indigenous to Nepal, while strengthening one of the country’s most vital economic sectors. This is who we are.